Another cake that I’ve made in the past, and one that has been really enjoyed. Completely different to the rich Christmas cakes I’ve been making recently, this is a lovely light lemon sponge with added blueberries. It’s a pretty easy recipe; basically you just make a sponge cake, add the zest and juice of a lemon, then fold in some blueberries (reserving some to add to the top of the cake mixture before you bake it). You then bake the sponge in the oven for about an hour, and add caster sugar dissolved in lemon juice for the topping. 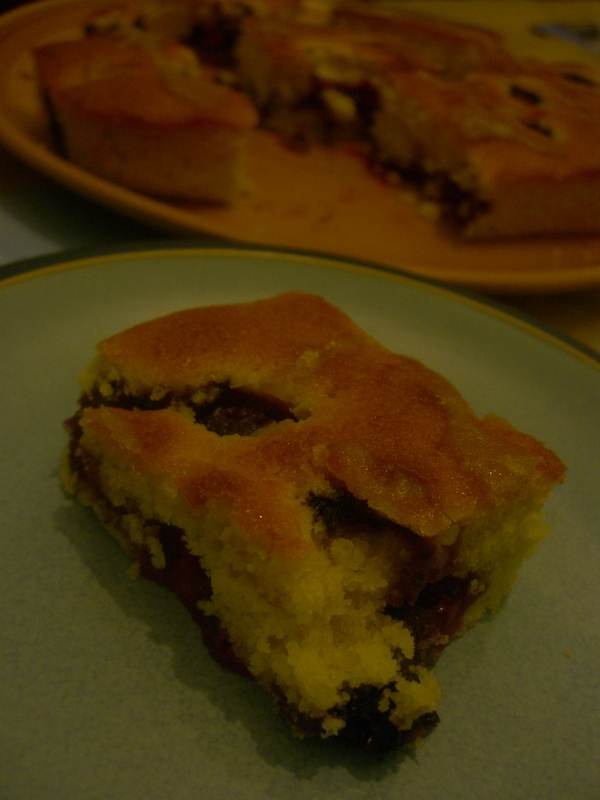 I admit that the majority of my blueberries did sink when making this, so most of them were at the bottom of the cake. However, it still tasted light and fresh and I’d happily make this again. This post is here as a warning: these were not that great. We had some blueberries and thought muffins would be nice, but sadly they were not quite sweet enough, not quite cooked in the centre, and a little burnt on top. The last two are obviously a problem with using our oven (it does that if you forget to take measures) but the first is a problem with the recipe. I just like sweeter muffins. No photos – we made these when I was very busy and I had no time. They looked fine – more cupcake sized than muffins but otherwise as expected. Recipe: Mary Berry’s Ultimate Cake Book, page 235.